It’s not many places that you get to find random women dressed up in Catwoman costumes. 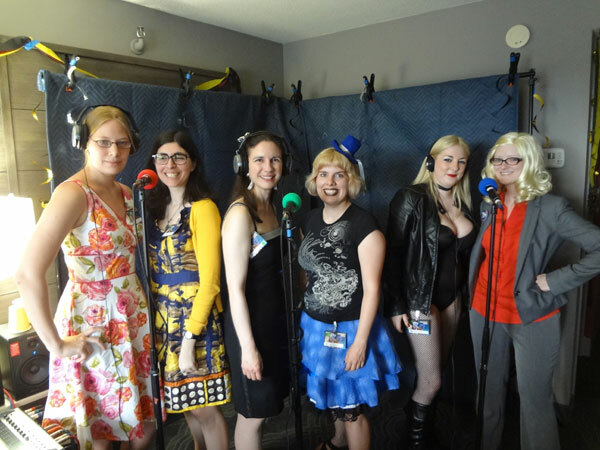 It’s rarer still to find ones interested in jumping behind the microphone and recording radio drama, but that was just the kind of scene you’d find at the inaugural Mark Time Broadcast Center held at the CONvergence Con in Bloomington, MN July 4-7, 2013. CONvergence (which boasts an attendance in the 5,000 – 6,000 range) has long been home to the Mark Time Awards, the only sci-fi/fantasy audio drama specific awards in existence. FinalRune has had the honor of receiving 2 Gold Ogle Awards (one for our 2008 “Waiting for a Window,” another for 2011’s “Intensive Care” with Aural Stage Studios) and 1 Silver Mark Time (for 2010’s pilot episode of “The Cleansed”). For the past few years we’ve enjoyed going to this CON and meeting up with audio drama producers from across the country and across the world – it was at the CON that we got to meet the awesome talents of Aural Stage Studios, Jonathan Mitchell (The Truth), Dieter Zimmerman of South Africa’s Protophonic, Jack Bowman and Robert Valentine of The Wireless Theatre Company, Domien and Eline of Audio Epics, and many more. But though we audio geeks love to get together and talk shop, we wanted to see if there is a way we could engage with the rest of the CON – the 4,980 people who did NOT already know about and love audio drama. The Mark Time “5 Minutes of Fame” was born. The concept, thus: you randomly walk into our hotel party room, pick up a script, grab a friend (or join with a bunch of strangers) and start acting. We provide all the sound effects and equipment, you lend your voice and get to experience radio drama first hand. We had an enthusiastic and engaged response – ranging from people who had never acted in anything before in their lives, to seasoned radio pros who were excited to push themselves a bit and try something new. Over the course of the weekend, at least a hundred people streamed in and out and learned a little bit about the joy us audio people share. We even had a podfic group join us to record some of their own material! If you’re local to Maine, email me back and I’ll make sure you get details on the Biddeford event.